Paracheirodon Axelrodi common name cardinal tetra. They grow up to 5 cm / 2 inches. They are best kept in water parameters of PH range 6.0-7.5, and temperatures of 23-27 °C/ 73.5-80.5 °F. 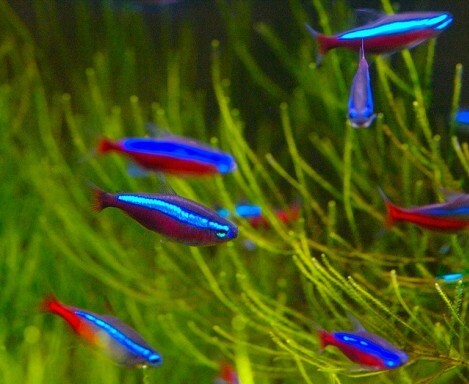 The cardinal tetra is related to the popular neon tetra. The cardinal tetra however are a brighter colour and are a lot more sensitive than the neon tetra. The cardinal tetra are not recommended for beginners. The cardinals much like the neons prefer to be in groups the larger the better, they are a lovely peaceful fish. Mixing them with any other smaller community fish is best, as bigger fish may enjoy them in there diet. They will eat any food you put in your tank for them. foods like flake, small pellets, and granular food. And as a treat freeze dried, live or frozen foods.